We hear about the learning gap facing many youth in our school systems. But what does that mean? A quick check on the Glossary of Education presents this: “[The] Learning gap refers to relative performance of individual students—i.e., the disparity between what a student has actually learned and what students are expected to learn at a particular age or grade level. That gave me something to measure the problem against. Are kids able to read at the right grade level at the right time? Then I thought about the kids our grants help. Some come from underserved neighborhoods, their families often struggling to make ends meet. If you’re having problems at home, knowing arithmetic may not seem like that big of a deal to some. However, the learning gap can become a bigger issue if left unresolved. Once a child falls behind, if they don’t receive the tutoring and assistance to bring them up to speed early in their education, the gap continues to expand. As the gap widens, it can be even harder for students to catch up, leading to kids struggling academically. Becoming frustrated, they often give up trying with many dropping out of school. This is a serious problem. It affects not only their future but also the strength of our communities, today and tomorrow. We need to make sure kids of all ages have the tools they need to receive a solid education and realize their full potential. Today on Leap Day, the McCormick Foundation and our Media Partners are Leaping the Learning Gap to raise awareness of the issue and also generate donations to fund programs so kids don’t fall behind. For every dollar raised, the McCormick Foundation will add another fifty cents – do the math. That means donations leap farther, doing more good. Together, we can give kids the opportunities to leap the gap so they can learn, grow and succeed. Make a donation to one of the following Fund Partner’s Leap Day Campaigns. Historically, the need for redistricting reform is an issue that has been supported by leaders on both sides of the aisle. During this year's State of the Union Address, President Obama addressed the need for having an independent commission draw legislative districts. President Reagan made a similar argument during his last days in office. To ensure that redistricting is addressed in this year's presidential campaign, a diverse, non-partisan coalition in Illinois has quietly been collecting signatures on petitions to put an important election reform on the November ballot. If successful, Illinoisans going to the polls on Nov. 8 will be able to vote to make future state legislative races more competitive and ensure their voices are heard in Springfield. The Independent Map Amendment would reform the way legislative district maps are drawn, and end the current process that allows politicians to manipulate elections by drawing districts to advantage a political party or incumbent. Under the Independent Map Amendment, maps would be drawn by an independent, 11-member commission representing the demographic and geographic diversity of the state. Legislative Districts would be drawn without regard to incumbency or political party, and the rights of racial and ethnic minorities would be protected. To qualify for the ballot, the coalition must collect at least 290,216 valid signatures of registered voters. The coalition has collected close to 500,000 signatures and has a goal of turning in 600,000 signatures this spring. Become a volunteer and/or sign a petition in favor of this Amendment by visiting MapAmendment.org. In early 2015, I was sitting in a community meeting daydreaming, when someone said in passing “Well, about 10,000 photographs are disintegrating at The Chicago Defender.” I snapped into the present. “What did you just say? !” I replied. The Chicago Defender is one of the few institutions that have chronicled the lives of African Americans in Chicago from the early 1900s to the present. That is why it is imperative that we salvage these damaged images and stories. Through its content, The Chicago Defender has been integral in moving the needle on countless historic issues facing African Americans including segregation in the military, campaigning against Jim Crow era violence, influencing the Great Migration and much more. My organization, the T.A.G. Foundation, is committed to preserving and sharing The Chicago Defender's photo archives, which is why we are in the process of building a digital platform, The Obsidian Collection. This online collection will house African American artifacts from across the country. 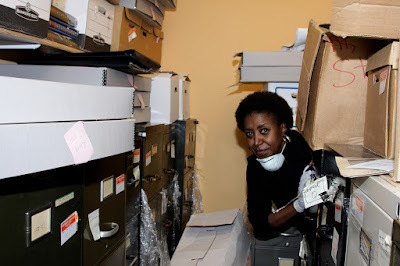 Once completed, our goal is to make The Obsidian Collection the most comprehensive digital archive of African-American history in the United States. The digital archive, which will be modeled after the Explore Chicago Collections, will provide historians, educators, and students a unified portal to access digital images and stories that capture major moments in African American history. With support of the The Chicago Defender's executive staff and generous support Robert R. McCormick Foundation we have set the stage for bringing this historic platform to life. To learn more about The Obsidian Collection and learn how you can support this effort visit The Obsidian Collection or email us at info@thisistagfoundation.com. Last August, the Robert R. McCormick Foundation, in partnership with Loyola University Chicago School of Social Work and the University of Southern California Center for Innovation and Research on Military Families (CIR), commissioned a study, the Chicagoland Veterans Study. This comprehensive study is intended to survey more than 2,000 veterans in Cook, Will, Lake and DuPage Counties to examine the needs of veterans living in Chicagoland area, and identify gaps and opportunities for program and service development. A range of issues are being surveyed including housing, employment, barriers to care, physical and mental health, and transition from the service to civilian life. In 2013, CIR first conducted this comprehensive study in Los Angeles County. You can find the results of the study here. Veterans can still participate in the Chicagoland Veterans Study. Once completed, participants will receive a $15 gift card. A comprehensive data analysis and findings from the study will be released in May 2016. Our hope is the valuable data gained from this study will allow government and community organizations across the four Chicagoland area counties to better understand the needs of veterans and their family members. For more information on the Chicagoland Veterans Survey contact Mariceli Serrano.